Toronto, ON (Apr. 8, 2019) – Two-thirds of people believe insurers are not fair – that insurers avoid paying out or hide behind bureaucracy to make it difficult for customers to get their money. As an insurer it seems obvious to say that paying claims is what we do but the fact is, we exist to pay claims. In 2018 we paid over 8.3 million claims across the Aviva group – that is one every four seconds. This was in 14 countries, across life, critical illness, car, home, travel and health insurance and represented 98% of all claims received, the same percentage we paid out in 2017. We believe it’s important to be transparent about our claims, so our customers have the confidence and reassurance that we’re here when they need us. View the infographic below or read on more to find out more about our claims story and what we’re doing to make it easier to claim. In December 2018 we launched an industry-first, subscription-style insurance product in the UK. AvivaPlus is designed to address consumer concerns with the industry and give customers more control. It offers simple, flexible insurance cover with no charges for cancelling or changing a policy and a renewal price guarantee for home and car insurance. The guarantee ensures existing customers are offered the same or an even better price than an equivalent new customer at their next renewal. We’re committed to making insurance easier for our customers, including simplifying the language and content of our policy documents to make what’s covered clearer to customers. Through our digital business, we’ve cut the number of unnecessary questions we ask when customers get a quote. This helps to avoid confusion and uncertainty about whether a claim will be paid. We’re using data and predictive modelling so we can be better prepared for natural catastrophes. In 2018 Canada had one of its worst storm seasons on record, with three windstorms in April alone and more catastrophes since, including the tornadoes that devastated the Ottawa-Gatineau area. Our use of data has made sure that our response improved with each event, and we had teams of adjusters on the ground helping customers from the morning after the tornadoes hit. Some claims are also rejected because the customer didn’t have the right level of cover they thought. We want to change this. While we are proud to pay as many claims as we do, we’re not complacent about it. We reject a small number of claims, just 2%. While we’re working to reduce this, there are some things that can help customers make sure that – if they need to claim – their claim will be paid. 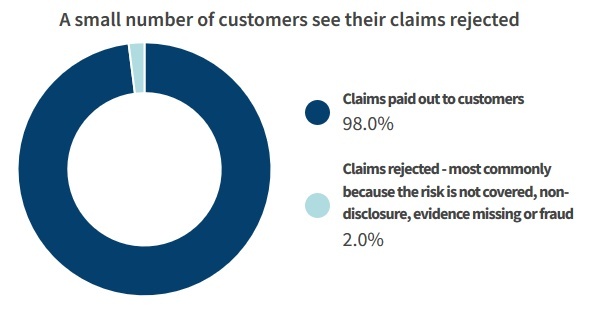 Risk not covered – The most common reason that we reject a claim is a mismatch between what customers believe their policy covers and what policies actually cover. While we’re working to make the language of our policies clearer and simpler, we also encourage customers to understand what a new policy includes when they take it out, so there are no surprises. Customers can also call us any time to check on their coverage and in some markets can check or switch their level of cover using the MyAviva app. Non-disclosure – We reject a small proportion of claims because of a pre-existing condition that the customer did not disclose when taking out the policy. While in most cases this is a genuine oversight, we need to make sure we keep a disciplined approach to our claims process. This means we cannot accept claims for risks we didn’t know about. Evidence missing – Sometimes we can’t accept claims because we can’t verify them. We’re taking action to simplify and speed up the process to make a claim, but there is still a need for customers to submit documentation to demonstrate the validity of their claim. Whether it’s evidence of an accident or a copy of an invoice they want to get reimbursed, we can’t pay if we don’t receive the relevant documents. Fraud – We have zero tolerance for fraud. By detecting and avoiding paying fraudulent claims, we help to keep premiums low for genuine customers. We’re also using data and predictive modelling so we can be better prepared and have our teams ready when they are needed. 2018 saw some of Canada’s worst storm seasons historically, with three windstorms in April and more catastrophes later in the year, including the tornadoes that devastated the Ottawa-Gatineau area. Learn more about our claims story across our markets – the UK, France, Poland, Italy, Ireland, Singapore, and India – in the Aviva.com press release. 1. According to Aviva’s Consumer Attitudes Survey, March 2018. 2. The percentage was calculated by dividing all paid and rejected claims by the total number of claims received between 1 January and 31 December 2017. The figure includes all insurance product lines across all our businesses and excludes benefits and pensions, which have a payout ratio of 100%. It also excludes invalid or incomplete claims, such as instances where claims were opened in error, abandoned or withdrawn by customers.